At the heart of every bee hive is a queen bee. Since her well-being is linked to the well-being of the entire colony, the ability to find her among the residents of the hive is an essential beekeeping skill. In QueenSpotting, experienced beekeeper and professional “swarm catcher” Hilary Kearney challenges readers to 'spot the queen' with 48 fold-out queenspotting puzzles — vivid up-close photos of the queen hidden among her many subjects. QueenSpotting celebrates the unique, fascinating life of the queen bee chronicles of royal hive happenings such as The Virgin Death Match, The Nuptual Flight — when the queen mates with a cloud of male drones high in the air — and the dramatic Exodus of the Swarm from the hive. Readers will thrill at Kearney’s adventures in capturing these swarms from the strange places they settle, including a Jet Ski, a couch, a speed boat, and an owl’s nesting box. Fascinating, fun, and instructive, backyard beekeepers and nature lovers alike will find reason to return to the pages again and again. 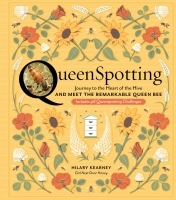 Popular urban beekeeper Hilary Kearney challenges nature lovers, science fans, and beekeepers alike to 'spot the queen' in 48 amazing fold-out photo puzzles, accompanied by stories of the dramatic life of the queen honey bee and stories of swarm-capturing adventures.